Most fluoropolymers are based on a combination of fluorocarbons. 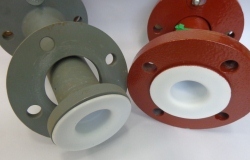 Among other fluoropolymers, polytetrafluoroethylene (PTFE) is used for wire and cable insulation, pipes, valves and vessels, coatings in general e.g. for cookware, waterproof laminates on textiles etc. Their peculiar properties include fire resistance, mechanical strength, insulation, low surface tension and resistance against chemicals.